1. Nothing will affect your financial future more than your ability to understand your household cash flow. If you want more money to save for the future or to spend now, you have to understand your current spending patterns and habits to get there. Check in on your spending weekly; that takes far less time than a monthly review, and it’s easier to catch places you may have spent more than you planned. It’s easy to live lean for a week if you’ve overspent in a previous week. It’s a lot harder to catch up if you’ve been overspending for a month. 2. The clearer you are about what you want to do in the short and long term, the easier it is to make spending choices that you’ll be happy with when you look back at them. 3. Limit your monthly bills. We all know that $10 here or $50 there will not break the bank but when these bills add up every month that $50 here and there can turn into $5,000 over the course of the year. Think of those monthly expenditures as an annual expense, which should give you a better look at how much is actually going to be taken out of your salary. 4. Automate your savings for present and future goals. Chances are you get paid by direct deposit, and it’s easy to direct funds into multiple accounts. 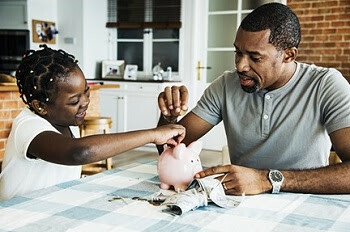 Beyond your basic emergency fund try setting up multiple savings accounts to have balances grow for specific goals (a trip to Europe, or a new car). This allows you to see the specific progress you’re making. The same concept applies for retirement plans at work. If you can save that money automatically before it reaches your bank account, you’re far more likely to continue saving those funds in the future and even to increase your contributions over time. 5. Plan for spontaneity. This may sound contradictory, but most professionals think it’s essential. A good solution to this is to build in money that is purely for spontaneous spending. If you know there’s money in your budget that is there for the sole purpose of spending it, it protects the money that you’re saving into other accounts by providing an outlet for a spur-of-the-moment decision.